The market currently values TheStreet's B2C business at $4M. After the cash divestment, there will be little else left in the company. A significant amount of risk remains around how long Cramer will be involved in the company. Last Wednesday, TheStreet (NASDAQ:TST) announced the distribution of $94.3M of cash generated by the sale of its B2B businesses. In that same announcement, the company estimated that $18.5M-$21.5M of cash would remain following the distribution and payment of certain deal-related costs. That means, in aggregate, TheStreet's current cash-on-hand balance is ~$114M. Note: Before I dive into my analysis, it is important to note that I work for Seeking Alpha. TheStreet lists Seeking Alpha in its 10-K as a competitor. The above-mentioned number is striking when compared to the market cap. At the time of writing, the market cap is $118M with a share price of $2.29. The enterprise value calculated by most sites is $81M, as seen on the Seeking Alpha valuation tab. However, that enterprise valuation is being calculated on the basis of reported cash as of Dec. 31, 2018. This is before the cash was received from the completion of the sale of The Deal and BoardEx to Euromoney. Once that cash is factored in, the market values the remaining B2C business at just $4M. The key question is whether this valuation makes sense for the business that remains, and if there is any upside to that business. The following numbers are taken from TST's 10-K, as a carve-out of the B2C business. There are several significant differences between the 2017 financials and the 2018 financials. First, revenues declined by $3.5M. Of this, $3.1M is attributable to advertising revenue. Second, cash costs (excluding depreciation and amortization) decreased by $0.7M. 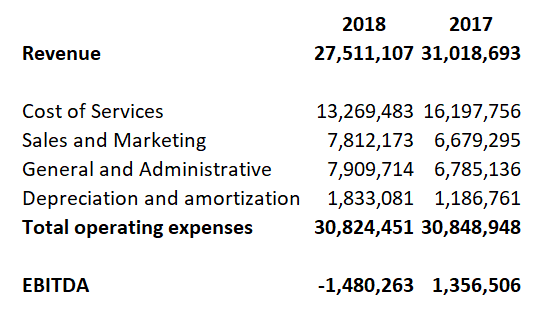 There is a lot of moving around within the line items: For instance, cost of service decreased by $2.9M, while both sales and marketing and general and administration increased by $1.1M each. It is possible that some of the movement in the numbers relates to attribution of costs between the B2C and B2B businesses. If this is the case, this will level out going forward now that the B2B businesses have been sold. The decrease in advertising revenues was attributed in the Q4 earnings call to "declines in repeat and non-repeat advertisers, as well as from lower page views resulting from [fewer] articles published year over year." The reason for lower page views as a result of fewer articles published is cause for concern. Traffic, and in particular article traffic, is at the core of a business such as TheStreet and drives the top of the funnel for its subscription business, as well as being a mark of its long-term sustainability. All that notwithstanding, during the earnings call CEO Eric Lundberg said that SEO had now become a focus and that SEO was up. This should stem the concerning trend. Well, we've already taken significant steps and we're continuing to take significant steps all the time. So, we recently said goodbye to quite a few of our leadership team. We will be rationalizing the size of our board. We're looking at every line item. We've looked at every vendor. Every vendor in our company we have analyzed and we're looking at ways to restructure. I'll give you other examples. So, we recently put in a new phone system in our New York office. It doesn't sound like a lot, but it's going to save us $50K per year. I mean, we're - so we're looking at everything from salary, which is about 60% of our cost base, to professional fees to board costs to even $50,000 vendor relationships. So, we can expect a business with revenue of around $28M and an EBITDA between zero and negative $1-1.5M. The EV/sales ratio of the B2C business comes in at 0.15. Comparing this to other publishers, it's a low number. Even Tribune Publishing has a sales/EV ratio that's more than double. And there are plenty of other publishers with higher multiples. All that notwithstanding, there are two risks that are significant with regard to TST. First, TheStreet.com is a small property, and it is tough being a small website. For many years, Google (NASDAQ:GOOG) (NASDAQ:GOOGL) and Facebook (NASDAQ:FB) have been taking a larger and larger share of marketing budgets, and this has created a hostile environment for small publishers to monetize their sites. TST derives around one quarter of its revenue from advertising, but this isn't the only risk in relation to being a small publisher. Website traffic and the resultant audience can be very dependent on Google and Facebook. SimilarWeb lists 53% of TheStreet.com's traffic as organic search. Key content contributors, particularly James J. Cramer, are important to our premium subscription offerings. Some of our products, particularly our editorial subscription products, reflect the talents, efforts, personalities, investing skills and portfolio returns, and reputations of their respective writers. As a result, the services of these key content contributors, including our co-founder and chief markets commentator, James J. Cramer, form an essential element of our subscription revenue. In addition to his content contributions, we benefit from Mr. Cramer's popularity and visibility, which have provided public awareness of our services and introduced our content to new audiences. For example, Mr. Cramer hosts CNBC's finance television show, Mad Money. If, however, Mr. Cramer no longer appeared on the show or the program was cancelled for any reason, it could negatively impact his public profile and visibility, and in turn, our subscription products. Further, the continued value of Mr. Cramer's contributions could be materially adversely affected if Mr. Cramer were to otherwise lose popularity with the public. While we believe we greatly benefit from Mr. Cramer's contributions and his media exposure for other companies, we can give no assurance that our relationship with Mr. Cramer will lead to higher revenues from our subscription products or improve our organic growth. On Nov. 8, 2017, the company and Mr. Cramer entered into an amended and restated employment agreement with a new four-year term, effective Jan. 1, 2018, through Dec. 31, 2021. The employment agreement may be terminated by Mr. Cramer for specified events provided under the employment agreement, and if Mr. Cramer does not complete the term of his employment agreement, our business could be harmed by the loss of his services. In addition to Mr. Cramer, we seek to compensate and provide incentives for key content contributors through competitive salaries, stock ownership and bonus plans and/or royalty arrangements, and we have entered into employment or contributor agreements with certain of them. If we are unable to retain key content contributors, or, should we lose the services of one or more of our key content contributors to death, disability, loss of reputation or other reason, or should their popularity diminish or their investing returns and investing ideas fail to meet or exceed benchmarks and investor expectations, we may fail to attract new content contributors acceptable to readers of our collection of Websites and editorial subscription products. Thus, the loss of services of one or more of our key content contributors could have a material adverse effect on our business, results of operations and financial condition. It isn't clear what the revenues and expenses associated with Jim Cramer are, as well as the resultant profit margin. However, Cramer is already 64. It's not clear if TheStreet has a plan for the "day after," and what the impact on the company is. At some point, Cramer will look to retire, and beyond that date it's unclear from the public information whether TST will continue to be a going concern. The market values TheStreet's remaining B2C business at bargain basement prices. All that notwithstanding, mainly due to uncertainty beyond Cramer's retirement it's not clear that the business can justify even these valuations. The domain name likely commands a low seven-digit valuation; however, it's unclear whether a website the size of TheStreet.com can be profitable, or even survive, in an increasingly competitive world. A share price of $2.21 values the ongoing business at zero. While the current share price supports a value of $4M for the B2C business, until there is clarity on what comes after Cramer, it is not a clear buy at these prices. Additional disclosure: I work for Seeking Alpha, which is listed in TheStreet's 10-K as a competitor.